Your best buddy deserves a hearty meal that also is nutritious. 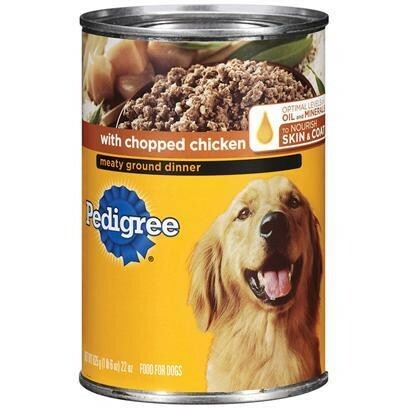 PEDIGREE Chopped Ground Dinner With Chicken Canned Dog Food provides the best of both with a traditional ground texture that will make your dog's mouth water. Formulated with optimal levels of oil and minerals to nourish their skin and coat, our adult dog food provides complete and balanced nourishment with highly digestible ingredients. Give your dog a meal that delivers big flavor and nutrients with PEDIGREE Chopped Ground Dinner Wet Dog Food.